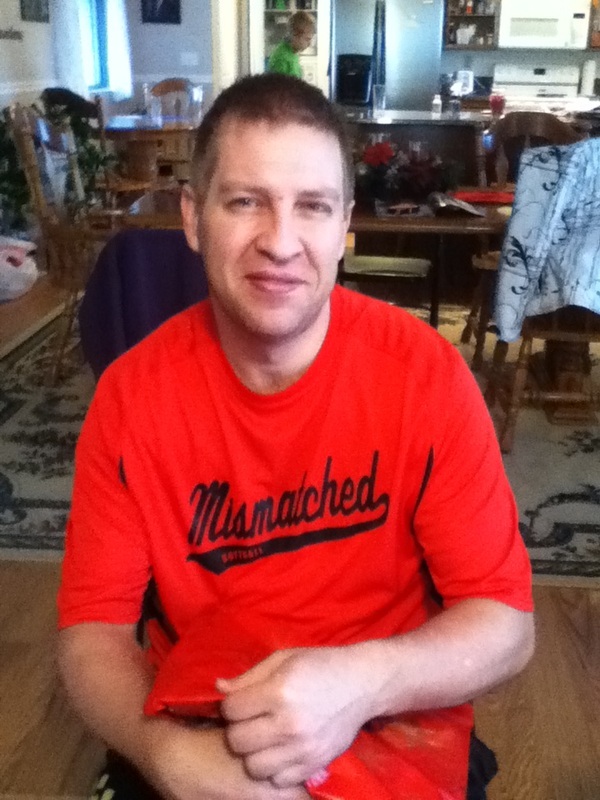 Ryan was able to get stem cell treatment in China in December of 2012. He didn't see changes in his vision while he was in China, but he has seen some changes since he's been home. Here are a few of the changes we've seen the past few months: He is able to sit a few feet back from the TV, and see the computer from farther away. He has also been noticing more details about things that he hasn't noticed before. We have noticed some good things happening with Ryan's vision the past few months since we've been to China for Stem Cell treatment. One of the first things that Ryan mentioned was being able to see a silver wall switch plate one Sunday at church a couple of months ago. Marc and Ryan were in the church gym sitting under the basketball banker and Ryan said he could see the silver switch plate on the wall. About two weeks later, on another Sunday, Marc and Ryan were driving to church. A stoplight turned green and Ryan said, "I can see the green arrow light!" Before this happened, Ryan could only tell that there was a green color, he couldn't see the arrow. We've also noticed that Ryan is sitting further back from the TV. Usually he is very close, but now he is able to see from farther away. He mentioned last week that he could see more detail on the computer screen when he's sitting farther away too. The missionaries came to visit us about three weeks ago. We were sitting on one couch and the missionaries were sitting on another. When they left Ryan was excited. He said, "I could see their mouths!" Ryan usually cannot see the details of someone's face from that far away. We are so happy about these wonderful improvements. Again, THANK YOU to everyone that helped Ryan go to China to get stem cell treatments and made this possible!!! 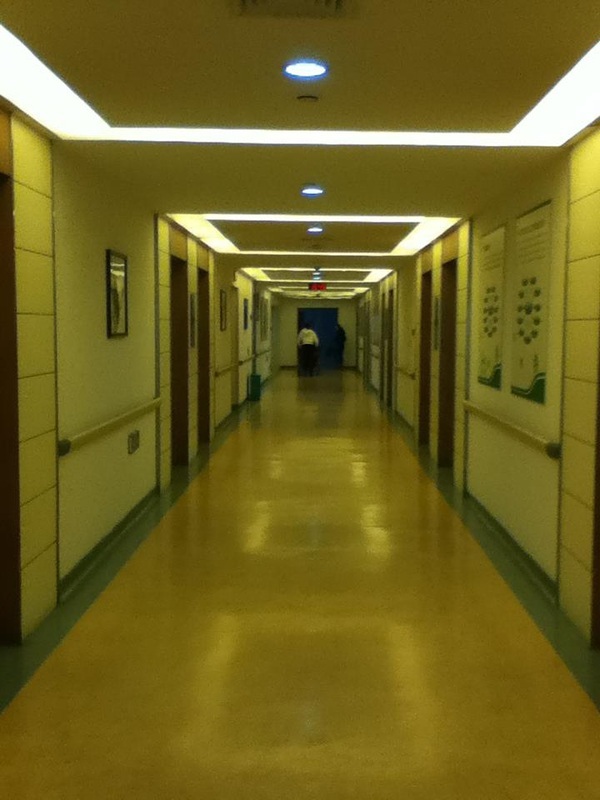 We got back from Ryan's stem cell treatments in Guangzhou on Dec 22, 2012. A family from Greece was also there getting treatments for their son with cerebral palsy. The mom sent me an email about what has happened since we left the Guangzhou hospital. We wish you a great and healthy 2013. We returned from China on the 3rd of January. We want to tell you that Panagiotis couldn't do his last stem cell IV, because Friday midnight on the 28th of December, the Chinese government shut the place down. Two persons came on our floor about midnight, they took all the posters about stem cell treatments from the walls,and with a hammer they took off the title "stem cell treatment ward" from the nurse station. In the next morning I asked a nurse what was going on and she told me "just redecoration". Sunday afternoon Beike director Enrico came over from Hong Kong and told us that someone who did stem cell treatment in another hospital and from another company who sells stem cells got really ill, and so the government shut all the places. We could do our last IV in Shenzen but we decided not to go because we had to leave at the same day for Greece. We definitely want to come back in the future. Greetings from us to all of you and lots of kisses from Panagiotis. Our representative contacted us as well. We were told that the mayor of Guangzhou is no longer allowing stem cell treatment. After an investigation, a place there in Guangzhou was busted for false stem cells. It was in some beauty parlor from what I understood. They have a lot of problems with people trying to sell false stem cell treatments there so the mayor has done away with it all together because it has become so much of a headache. They are still offering it in two of their other locations; Shengzhen China or Bangkok Thailand. We were informed that Shengzhen is not accepting young children and that they are dedicated to non-English speakers. A shirt from China. Sometimes they just put letters on the shirt and they have no meaning at all. Ryan just loves these two! Syd showing us her fan from China. When we were in Guangzhou I did a video interview of a mom from Canada and their stem cell success with her daughter Rosalie (8 year old blind girl). After her first 2 treatments (lumbar/IV together) she is seeing more light and now can see shadows/movement about 5-8 inches away. They put a Christmas tree up in the common room and she is fascinated with the Christmas lights. She can see them blinking, which she couldn't do before. Before the treatments she always had her chin to her chest because there was no reason to hold it up. She is now holding her head up by herself. Amazing! Rosalie and her mom. They are from Canada. They've already had improvements from the stem cell treatments. It takes an hour to travel to the airport. Here we are at the Guangzhou airport with Rita. One last goodbye photo. She just loved Ryan's tiger sweatshirt. Every time she saw it she would laugh. landed. We'll visit family in Utah for Christmas. One last chicken nugget meal from McDonalds before we go to the airport. They put signs on all the doors of the people who have traveled to China to get stem cell treatment. This is Rosalie's name tag. The Guangzhou (Baiyun) International airport is HUGE! 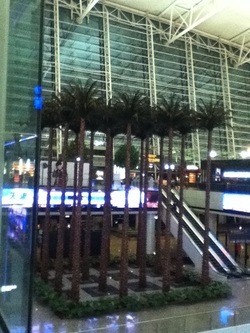 It had 4 levels and TALL palm trees growing inside the airport terminal. Ryan, hasn't had a change in his eyes but they say we should be patient and have them checked in three months. There is an 8 year old blind girl from Canada that started treatment last week that is seeing more light and now can see shadows. They put a Christmas tree up in the common room and she is fascinated with the Christmas lights. She can see them, which she couldn't do before. She is also holding her head up by herself, before she always had her chin to her chest because there was no reason to hold it up. Amazing! I've met three families so far with children who have cerebral palsy. There is a 3 year old boy from Greece that started treatments two weeks ago. His mother says since the treatments he has said 3 new words in one day. He also can grasp a lollipop, put it in his mouth and take it out again. She said he had never done any of those things before. There is another mom from the UK that brought her 2 year old son, George, for the second time this year for treatment. She said that his physical therapists said there was definite improvement since they came last January, so they came again for more treatments. The third family was from South Africa. They brought their 17 year old daughter. They said they had tried everything, along with hyperbaric oxygen treatment. 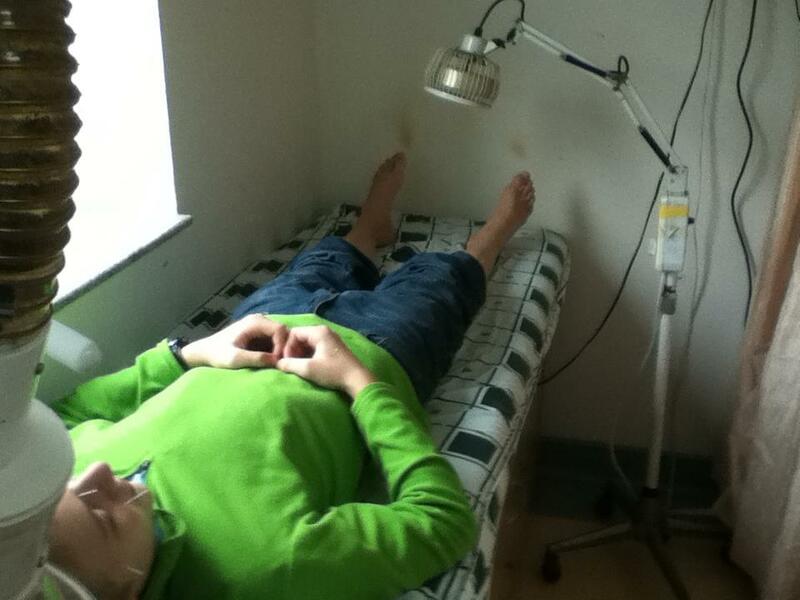 The doctor always puts heating lamps on Ryan. Ryan sometimes gets too hot and has me turn them off. This is Tina from Greece. Her son, Panagiotis, is 3 years old and has cerebral palsy. He has learned three new words in one day and is able to grasp and hold a lollipop and put it in his mouth and take it out again. Both are things he couldn't do before he started his stem cell treatments two weeks ago. We can go shopping at Carrefour every Tuesday and Thursday. There's an ATM in the ICBC Bank on the 2nd floor. Every foreign patient has their name and the flag of their country on their door. Just yesterday they put up a Christmas decoration on all of our doors. The hallway on our floor. Looking at the hospital grounds from the indoor walkway that takes us from the In-patient rooms to the hospital. Everything is beautifully manicured/designed. Second to last eye therapy treatment. The fellow beside Ryan is Ahmed from Libya. He is 25 and just started treatments today for his blindness. They had Christmas trees and Christmas decorations in Carrefour. I loved the little baby riding the red donkey. Ahmed from Libya. Here for eye treatment. Another view of the hospital grounds from our 10th floor. Patients can go out for a nice, peaceful walk and get some fresh air. They have a Pizza Hut "extended menu" we can order from at lunch and dinner. Ryan ordered Cream of Mushroom Soup and a salad. I ordered the Potato Soup and a salad. They were good. We can also order takeout from McDonalds, KFC and some local Chinese restaurants. Cool trees with hanging moss. Ryan's Mom & Dad, with help from Ryan's sister.